Yesterday’s New York Times featured John Tierney’s profile the great math puzzlist Martin Gardner for his 95th birthday, which is today. For today’s mathematical puzzle, assume that in the year 1956 there was a children’s magazine in New York named after a giant egg, Humpty Dumpty, who purportedly served as its chief editor. Mr. Dumpty was assisted by a human editor named Martin Gardner, who prepared “activity features” and wrote a monthly short story about the adventures of the child egg, Humpty Dumpty Jr. Another duty of Mr. Gardner’s was to write a monthly poem of moral advice from Humpty Sr. to Humpty Jr.
At that point, Mr. Gardner was 42 and had never taken a math course beyond high school. He had struggled with calculus and considered himself poor at solving basic mathematical puzzles, let alone creating them. But when the publisher of Scientific American asked him if there might be enough material for a monthly column on “recreational mathematics,” a term that sounded even more oxymoronic in 1956 than it does today, Mr. Gardner took a gamble. He quit his job with Humpty Dumpty. On Wednesday, Mr. Gardner will celebrate his 95th birthday with the publication of another book — his second book of essays and mathematical puzzles to be published just this year. With more than 70 books to his name, he is the world’s best-known recreational mathematician, and has probably introduced more people to the joys of math than anyone in history. Cambridge is currently in the midst of publishing Gardner’s entire Scientific American catalog – the first time they’ll appear in a set. 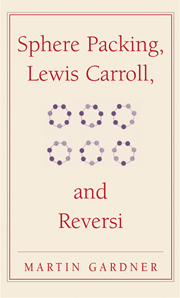 The latest book is Sphere Packing, Lewis Carroll, and Reversi.